Yes, it’s that time of year again. As we move into the holiday season, it is a good time to look back on the past year and reflect on the things that we can be thankful for. I know that for many people with Parkinson’s Disease and other chronic diseases, it is often difficult to find anything good in our lives. However, if we start by looking at the small things, we may see that there is much to be thankful for. I saw this morning that Parkinson’s Life, from the UK, just reposted my blogpost from 3 years ago, about 10 things to be grateful for on Thanksgiving. So if they could use it again, I can. I reposted this 2 years ago with some changes. So here it is again, with a few more changes of course, because life has changed in the last 3 years. 10. Getting by on little sleep gives us much more time to spend playing games on our iPads in the middle of the night, while we are deluding ourselves into thinking that these games may actually help our brain cells regenerate. I have cut back on the games in the middle of the night, but sleep still eludes me. The latest research is showing that some of these brain games actually do help with memory. Writing this blog is just one of my OCD behaviors. 9. We can blame our Obsessive/Compulsive behaviors (see #10) on our medications and the non-Parkies will believe us. Writing this blog is just one of my OCD behaviors. And because of this, I have begun writing letters to the editor and to others to express my opinion. And some have even been published. I have become much more vocal about many things. 8. Waking up at 5:00 am doesn’t seem so early anymore. But why am I always late to my 8:30 yoga class? (See #10. Still playing those stupid games on my iPad) Still waking up too early, but I get to walk my dog at dawn and enjoy the sunrise. And then I play those stupid games….. Still can’t seem to get to yoga on time, but we had another grandchild this year and I often talk to her mother as I am getting ready to leave. Besides, facetime with the grandchildren is much more important than being on time anywhere. 7. I can do things with my left hand now that I would not have been able to do if that damn tremor in my right hand didn’t act up when I am trying to do something like eating, writing, brushing my teeth……you fill in the blanks. Fortunately Sinimet has been very effective for me and I am right-handed again. Yeah! Another thing to be thankful for. Sinimet is still my saviour!!! 6. Living with PD has taught me to be more pro-active about my health. I keep up with the latest research and always go to my doctor with a list of questions and concerns. This is probably the most important thing that I have learned in the last few years. My internist jokes that I know more about PD than he does. 5. All of the new friends that I have made who also have PD. We can laugh and cry together about things that non-Parkies would never understand. Last January I started a group for women with PD in the Los Angeles area. As we have gotten to know each other, friendships have blossomed. We really do have a special bond because of PD. This really is a special bond. 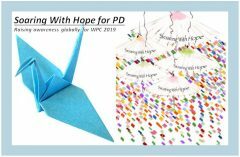 We found each other because of PD, and we are there to support each other cope with PD and other issues. More importantly, we also get to celebrate many good things together. 4. Fortunately I have a slowly progressing form of PD, which is controlled by meds. Better living through Chemistry is my mantra. And my progression continues to be very slow. And for that I am very thankful. The progression is still slow. I was diagnosed about 10 years ago, and I am very thankful and grateful that I really haven’t had to change much in my life because of Parkinson’s. 3. Laughing with PD. When all else fails, I can always blame stupid things I do on that !? @$# tremor. Enough said…..
2. Loving with PD means cherishing the life my husband and I have together and making adjustments as we need to when that @$#% Tremor gets in the way again. Our third grandchild was born in July, adding to the joy in our family. We are truly blessed. My husband, my daughters and their families give me the greatest joy. Our fourth grandchild was born this year, and I am most thankful that I can still sit on the floor and play with all of our grandchildren. 1. Living with PD has enabled me to reach out to others like you, hopefully making all of our lives just a little bit better. I thank all of you for your support over the last year and I hope that we will continue the dialogue for many years to come. Thank you! Your ongoing support of this blog has been a giant dopamine boost for me. Looking forward to sharing my thoughts with you again in the coming year. One last thank you: Thanks to all of you, Twitchy Woman was listed first in Everyday Health’s 10 Parkinson’s Disease Blogs to Help You Stay Fit and Positive and received recognition for the third year in a row from Feedspot, ranked #30 in their top 50 Parkinson’s blogs. and blurry or double vision. The blink reflex can be slowed down, leading to less blinking and dry eyes. One of the first things one neurologist said to me is that when I entered his office “he saw it in my eyes”, when I asked why, he said that I did not blink enough. So let’s backtrack to 20 years ago. I was fortunate enough to have Lasik surgery to correct my vision. I had been wearing glasses since I was 10, contact lenses since I was 13. Imagine waking up the morning after surgery and being able to see the alarm clock for the first time in almost 40 years without glasses. Lasik surgery changed my life and my vision was stable for many years. So when pesky symptoms such as dry eyes started to become annoying, I assumed I could blame it on Parkinson’s. Then I started having other problems. My depth perception seemed off at times. And for some reason, I no longer needed to use reading glasses. I liked that, but had no idea why this changed. About 1 1/2 years ago I went to get my eyes checked to find out what was going on. My optometrist noticed a cataract forming in my left eye, which accounted for the depth perception problems. And because my vision was different in each eye, reading became easier. So I was wrong. This was not a PD issue. It was an aging problem. Everyone eventually developes cataracts, which cloud the lens in your cornea, often distorting everything you see around you. This accounted for the haloes I was seeing instead of stoplights, and for the flowery moon. Within 1 1/2 years, cataracts in both eyes progressed faster than we both expected, making night driving almost impossible, even with glasses. And I kept forgetting to put on my glasses. After 20 years of not wearing them, I could not get used to wearing glasses again, so I often took them off and then forgot where I put them (many times they were on top of my head). Kind of like walking into a room and forgetting why you came there. So to make a long story short, after 1 1/2 years and 3 eyeglass prescription changes later, my optometrist decided that it was time to get rid of the cataracts. While I was having trouble seeing out, he was having trouble seeing into my eyes. He then referred me to the same eye surgeon who had done my Lasik surgery. The interesting thing about Cataract surgery is that it is mandated by Medicare that you must have only one eye done at a time, with a minimum of two weeks in between. Which means being sedated lightly (not totally asleep) by an anesthesiologist twice within a few weeks. You need to be somewhat awake but relaxed during the first part of the procedure, so that you can watch the psychedelic light show going on in your eye. In the last few weeks there have been some concerns raised in the Parkinsons community about anesthesia and PD. All I can tell you is that I had no problems with having anesthesia. If you are considering any surgery and have questions about this, I would suggest that you speak to your Movement Disorders Specialist or Neurologist about the pros and cons of having anesthesia with PD. As for my eyes, I can see again! And now I can turn those fun purple prescription glasses into fun purple sunglasses. I wish I still had this racket! warping. My earliest tennis idol was Billy Jean King and I even had a Billy Jean King tennis racket. When Mr Twitchy and I moved to Los Angeles, playing tennis was an easy way to meet new people. Eventually the wooden tennis racket gave way to the new lighter graphite rackets in the 80’s and my tennis game improved. My tennis idols and my rackets have changed over the years and I have been fortunate to have attended 3 of the 4 Tennis Open tournaments in the last 10 years. I am hoping that I will be able to get to the fourth, the French Open, in the next few years. When we moved to a new house and new school for our kids, tennis was again the intro to new friends. In fact, I have been playing in a regular game for over 25 years with three other women whom I met at the elementary school Tennis Tournament Fundraiser so long ago. They are my friends, my confidants. After my tremor started 10 years ago, they were the first to know about it. When it was difficult to talk about my Parkinsons diagnosis, they were the ones who were there for me, refusing to let me take the easy way out and quit playing tennis. When I told one doctor about them, his advice was to “keep those friends”. That was the easiest doctor’s order I have ever followed. Tennis has literally kept me going through the worst of times with PD. It hasn’t always been easy. My stamina and balance vary from week to week, my feet don’t always move as well as they should and I frequently lose my grip on my racket for no reason. I have often thought about finding a way to glue my racket to my hand so that I can’t lose my grip. Whew! That is quite an ambitious statement! I love the “serene relationship” part. Overall, I agree with them totally. Tennis is a great total workout for you, requiring hand-eye coordination (not always easy with PD), quick movements and lots of concentration. Sharpe also posted an article by Jan Jackson, a woman with PD who plays 🎾, this time in English. She put into words exactly what it has felt like for me playing tennis with PD. She increased the amount of time she plays tennis because of PD. On the other hand, I had decreased my playing to once a week because I found that there was little extra time for tennis in addition to my regular daily exercise programs (yoga, boxing, etc.) However, I have recently added a second day of tennis, with a “Live Ball”* clinic at the club we belong to, that has really helped improve my game with PD. I am hoping to be able to add another day of tennis to my workout schedule sometime soon. My hope is that I will continue to play tennis with my friends, Gayle, Martha and Lenore, for many more years to come. Thank you for being there for me all these years. *Live Ball is a fun doubles king/queen of the courts-type game played where tennis balls are fed by a tennis pro to start points instead of serves. Hey baby it’s cold outside! Hey baby it’s cold outside! And windy and rainy. Not a good combination for Parkies. Mr. Twitchy and I embarked on a cruise from Reykjavík to Montreal yesterday after a couple of great days exploring Iceland. Submerging in the warm waters of the Blue Lagoon was truly therapeutic. The sights along the Golden Circle were wonderful. And now we are on the second of 3 days at sea on a rockin’and rollin’ North Atlantic. Walking anywhere on the ship has been a challenge, adding PD to this has only made it more fun!!! In fact, everyone on the ship looks like the have PD balance problems. When I returned to my suite at noon, I was treated to the most spectacular rainbow! That made up for the bad weather. October 1 marks the return of Breast Cancer Awareness month. I have seen a big uptick of views of the blog post “ Breast Cancer vs Parkinsons“ in the last few weeks. What I wrote two years ago in that post still holds true. Bloomingdales was already pushing their promotion when I was there last week. And then I got an email the other day that the very popular game, Words With Friends, was jumping into the promotions as well. This October, they want you to join Words With Friends as you “Play Pink For The Cure”; if 6 million Pink Ribbon tiles are played before 10/21, Zynga will donate $100,000 to benefit Susan G. Komen. This means that a lot of people will be playing the game and will be getting the message about supporting breast cancer research. That’s terrific, and I will support it because I am a Breast Cancer survivor. Maybe we can convince Zynga, the game company that produced Words With Friends, and other game developers to do the same thing for PD next April. Think of the possibilities! In the meantime, you can support the Parkinson’s Foundation by signing up for a Moving Day walk near you this fall. If you live in the Los Angeles area and would like to walk with Twitchy Women on October 21, join our team. If you can’t join us, consider making a donation. If you can, support both causes. These organizations are doing great work to help find a cure and to improve the lives of those who have Breast Cancer and/or Parkinson’s Disease.